Google is making several significant changes to the way Assistant works. The aim being to allow Google Assistant to converse more naturally with users. Google is also adding a number of new voices and positive reinforcement for politeness. Google is pushing hard to make Assistant the one AI to rule them all. And at Google I/O 2018, the company has announced a number of new features coming to Google Assistant in the near future. The main one of which is called Continued Conversations. Continued Conversations means Google Assistant can carry on a conversation without you having to say “Hey Google” before every request. Instead, once enabled, you’ll be able to have a natural back-and-forth conversation with Google Assistant. In addition to this, Google Assistant can now understand and respond to more complex queries. The example Google gives is, “What’s the weather like in New York and in Austin?”. This obviously requires two answers, which Assistant will now be able to provide. Google is also adding new voices to the mix. This means you can now choose from six new voices, adding a touch of customization to the overall Assistant experience. And for some strange reason John Legend will be lending his voice to Assistant later this year. Google is also enabling Assistant to provide positive reinforcement. A feature called Pretty Please (coming later this year) means Assistant will acknowledge when children engage in polite conversation. Which is as simple as saying “Please” and “Thank You”. Google is currently battling hard against Amazon for control of the personal assistant space. And it’s surely no coincidence that Amazon recently gave Alexa the ability to listen for longer through her new Follow-Up mode. Google has just gone one better. 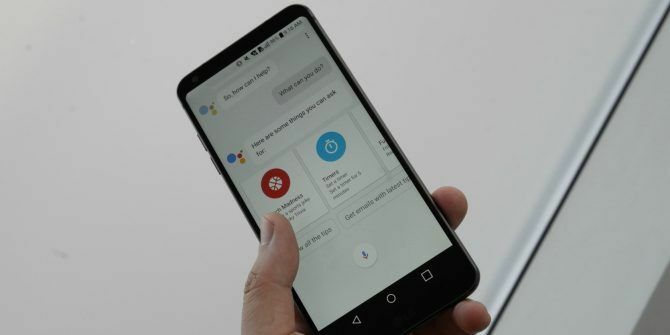 If you haven’t yet tried Google’s smart personal assistant we have an article explaining what Google Assistant is and how to use it What Is Google Assistant and How to Use It What Is Google Assistant and How to Use It Google Assistant is a powerful voice assistant for Android and iOS. Here's what it can do and why you should start using it. Read More . And if you’re already a fan we have found the best IFTTT applets to supercharge Google Assistant Supercharge Google Assistant With These 7 Amazing IFTTT Applets Supercharge Google Assistant With These 7 Amazing IFTTT Applets Google Assistant is great... but it can't do everything. Change that by using IFTTT to expand Google Assistant's functionality. Read More . Explore more about: Artificial Intelligence, Google, Google Assistant. I wish the tech companies would allow for personal names. Alexa is a girls name, Bixby is a boys name, Siri is a girls name and Google is non gendered but sounds weird when you use it in crowds specially if you have to repeat yourself. I wanna call my phone Mike! I have an iMac G4, just bought it as a vintage computer since I’m a vintage/modern Apple fan, and this was a great help. I am planning to use the computer to look at the OS (Mac OS X 10.4 Tiger), as well as see how big the possibilities for it are. I will definitely not be installing Linux, as for the most part the point of purchasing the iMac was to examine 10.4 Tiger, but I will take a look at TenFourFox. I will also be installing an AirPort card. The iMac G4 had the best Mac design ever, and it’s seriously some cool stuff. ?